Review: Fantastic Beasts 2 Plays Fast and Loose with Harry Potter Canon | The Gettysburgian. Promotional photo via Warner Bros. Currently sitting at a 39% approval rating on Rotten Tomatoes, Fantastic Beasts: The Crimes of Grindelwald is the lowest rated movie in all of the Harry Potter film franchise. It also had the lowest opening weekend on record for all of the films. Despite all the ire it generated in fans, the anticipated sequel to 2016’s Fantastic Beasts and Where to Find Them started off well enough. Eddie Redmayne continues to be lovable in his role as magi-zoologist Newt Scamander and continually makes me proud to be a fellow Hufflepuff. Set a year after the events the first Fantastic Beasts, the Ministry of Magic asks Newt – who is on the equivalent of wizarding probation for sneaking his suitcase of creatures into New York in the first film – to become one of their agents and help track down Credence Barebone (Ezra Miller), a dangerous Obscurial who inexplicably survived literally exploding in the first film. However, Newt refuses to accept a desk job and instead illegally sneaks off to Paris to find Credence, despite being banned from international travel, with the help of his non-magical American friend Jacob Kowalski (Dan Fogler). Jacob has problems of his own with his witch girlfriend Queenie Goldstein (Alison Sudol), who is anxious to get married despite America’s laws against wizard-human unions and ran off to Paris in tears after a fight with Jacob. Jacob and Queenie’s relationship is incredibly sweet and you can understand where both of them are coming from in this debate, with Queenie wanting to start a family like any other couple and Jacob not wanting to get the woman he loves in trouble with the law. Also in Paris, Queenie’s sister and Newt’s love interest Tina (Katherine Waterston) is also on the hunt for Credence, and she encounters a mysterious African wizard named Yusuf Kama (William Nadylam) who may have sinister intentions. The movie starts off strong enough with the reintroduction to the characters and the introduction to the Parisian wizarding world. Credence is now residing at a magical freak show in France and romantically involved with Nagini (Claudia Kim), a witch afflicted with a blood curse that will eventually cause her to transform permanently into a snake – and, as diehard Harry Potter fans know, one of Lord Voldemort’s most loyal servants in the original series. 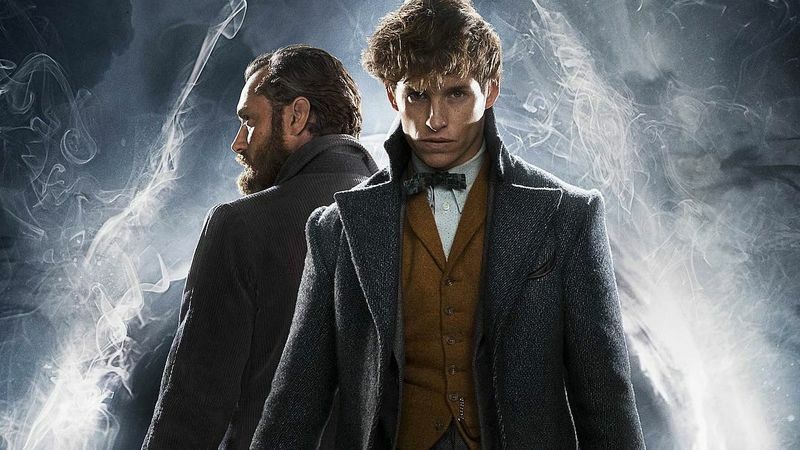 Jude Law is perfectly cast as a younger version of Professor Albus Dumbledore, who enlists Newt to find Credence before the dark wizard Gellert Grindelwald (Johnny Depp) can get his hands on the boy’s out-of-control magic. But in the third act of the film, everything goes incredibly off the rails. The film features a cameo of a young Professor McGonagall from the original series, but Harry Potter previously established her birth year as taking place after the events of this film – how can McGonagall work at Hogwarts before she’s even born? The film’s final plot twist involves an awfully convenient baby switch that feels straight out of a daytime soap opera, and a storyline in which a white man enchants a black woman to force her to have a child with him against her will. (And when you think about it, the plotline from the beginning of the movie in which Queenie puts a spell on Jacob to get him to elope to Europe with her is equally disconcerting – it’s played for laughs in the movie, with Jacob asking Queenie if she planned to remove the spell “after they had five kids,” but that begs the question if Queenie actually intended to wed and bed Jacob without his consent.) The reveal about Credence’s true identity left fans scratching their heads, and most of all Johnny Depp never should’ve been casted in this movie given his history of spousal abuse. He’s not even good either: he’s incredibly stiff and lacks the charisma which Grindelwald is supposed to be known for. Overall, Fantastic Beasts: The Crimes of Grindelwald had a promising start with a lackluster conclusion, blatantly disregarding things previously established as fact in earlier Harry Potter films. If the studio wants to get fans to see the next installment in the series, they need to prioritize their story’s integrity over cheap plot twists. Jackie McMahon '21 enjoys writing OpEd and A&E articles for The Gettysburgian due to her strong opinions about everything and her borderline unhealthy obsession with television. In her free time, she likes to binge-watch shows on Netflix, post on her Tumblr blog, and attempt to write a novel. She is passionate about feminism, cats and anything with chocolate in it. Her ambition is to someday become a best-selling novelist or a journalist.